Illustration: Karen Stiehl Osborn. Midpoint. The mixed media artist Karen Stiehl Osborn works in a range of mediums with a large selection of raw materials that can include canvas, cheesecloth, string, paper, paint, ink, dyes and threads, many of which can and are included within the same composition. This broad use of mediums, materials and working practice is at the heart of mixed media itself. 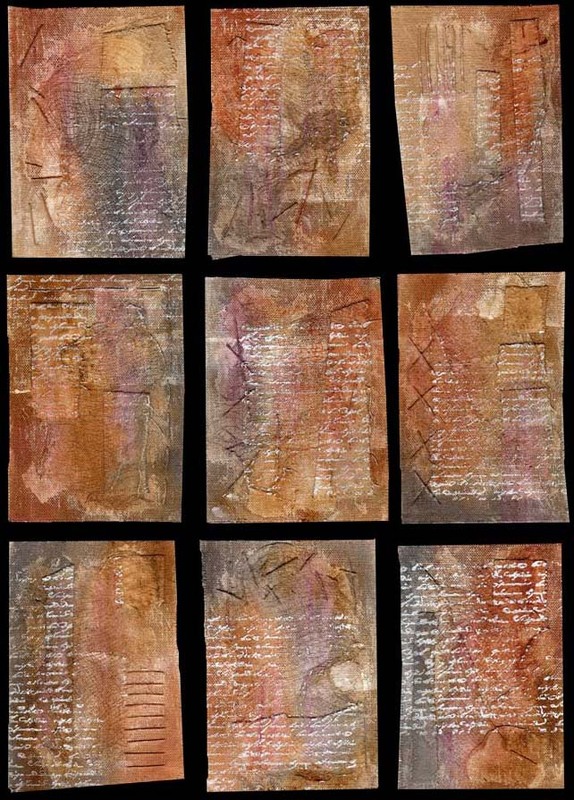 By its very nature a mixed media artist is one that can take a fairly wide-spectrumed view of both the world around them and the creative aspect in particular. Layering and juxtapositioning of complementary and often conflicting materials and subjects become familiar and creatively inspiring. This is the case with the work of Stiehl Osborn who has taken the natural tendencies of mixed media to a level that she has made her own. Illustration: Karen Stiehl Osborn. Delmar #5 to 15. In a series of compositional explorations, the artist has investigated, through her wide-ranging materials base, the interaction due to proximity of colour, texture and depth. These highly original, and by their nature personal explorations, add levels of meaning to a system of collage and layered medium that is infinitely variable even within a sometimes small compositional space. Through multi-series explorations such as Delmar, TEXtures and Summer Heat, we can see that the process of mixed media is fully open to both interpretation and independent analysis by the individual. The system is so readily and distinctively available for such fruitful exploration that it is no wonder perhaps that this particular discipline has seen such a relatively strong growth within recent years. Illustration: Karen Stiehl Osborn. Summer Heat #1 to 9. However, although the discipline can be such a strong attraction, particularly to those creative individuals who prefer to work outside of traditional boundaries and frameworks, this does not mean that mixed media is an easy option. Every discipline takes time and talent to master and mixed media, despite its open-ended policy, is no different. To take the range of materials and mediums, along with subject matter, personal and creative influences as well as compositional harmony and balance into consideration is a tough and uncompromising task that few can do justice to. Through her mastery of the discipline, Stiehl Osborn makes the whole process seem, if not effortless then at least readily achievable. The artist has produced a whole range of aspects of exploration that are both personal and creative. She fully understands what it is to be a mixed media artist and the particular and peculiar consistencies and indeed inconsistencies of the discipline are her tools in which to encounter and survey the full range of observational and emotional experiences. Illustration: Karen Stiehl Osborn. TEXtures #1 to 9. 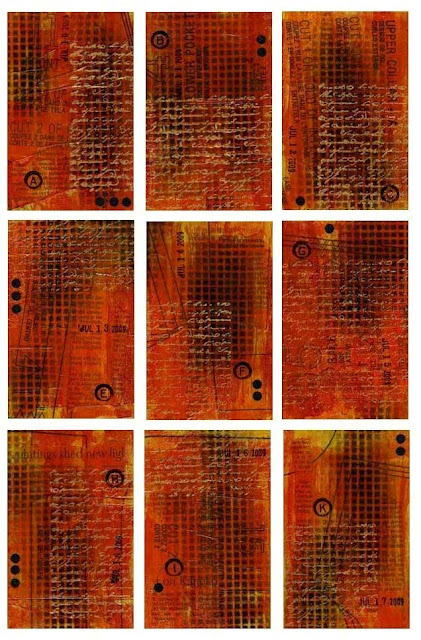 Karen Stiehl Osborn has exhibited across the US as well as internationally. Her work has been published in a number of books and magazines and the work itself has been collected both privately and publicly in North America, Europe and Australasia. The artist has both a comprehensive website where much of her work can be found, along with a frequently updated blog where work in progress can be followed. Both of these sites can be found below in the Reference links section. All images were supplied with kind permission of the artist. Thanks for sharing the work of Karen. I am a fan of her work. John, Your understanding of Karen's work was quite refreshing! Thanks for sharing your thoughts and Karen's work. Thanks for a great review of Karen's art. I own a few small and exquisite examples of her work, and it is better than the photos can do justice to. John has a special way of getting to the core of one's inspiration. Lovely. I like how the collages are displayed in sets of nine. Could make an interesting modular piece. Thanks for all your comments on this article. 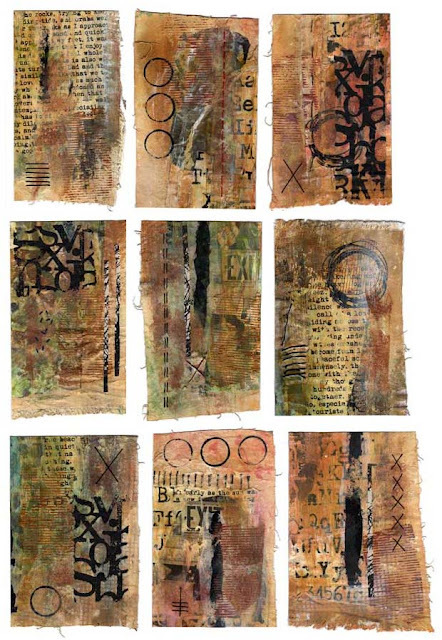 The next contemporary textile artist to be featured will be Jeanne Raffer Beck. absolutely lovely work. Thanks for the thoughtful review and the chance to see her work this way. I have been a fan of Karen's work for many years now. Its amazing to see her continually pushing herself and the mediums she chooses to work in... Bravo! I have always thought that mixed media makes such a valuable contribution to both the creative process and the vocabulary of art. I am more than happy to give it a little more publicity in my own small way, through The Textile Blog. I read a lot of different blogs, looking for inspiration for needlepoint design. This post is fantastic! I now have a new artist to watch and inspire a host of new designs for my own choice of media. Thank you!! Glad that you liked this article. The Textile Blog is committed to highlighting various contemporary textile artists, and will continue to do so on a regular basis. I love Karen's work. Thank you so much for posting it here and for your insightful comments about mixed media art in general. Thanks for your comment, it is much appreciated, and as I have said, there will be more articles concerning concerning textile and mixed media artists in the near future. Wonderful work! Really enjoyed the post John!